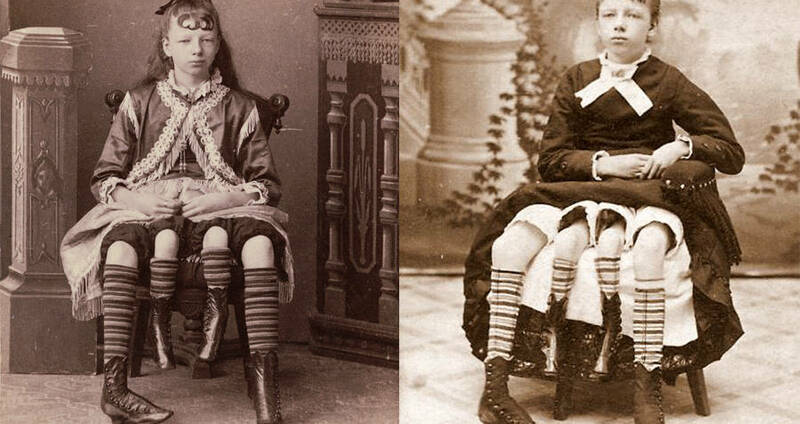 Myrtle Corbin and her legs. For all intents and purposes, Josephine Myrtle Corbin was a normal girl. Her birth was not marked by anything out of the ordinary, and her mother claimed to have had a typical labor and delivery, apart from the baby being momentarily in the breech position. Overall, Myrtle Corbin was a perfectly healthy, active, and thriving baby girl. All in spite of having four legs. After being born with four legs, two normal sized ones on either side of a pair of diminutive ones, the doctor who delivered Myrtle Corbin felt it necessary to point out the factors they felt could have resulted in her deformity. First, the baby’s parents, the doctors said, were about 10 years apart in age. William H. Corbin was 25, and his wife Nancy was 34. Second, the doctors noted that the couple bore a striking resemblance to each other. Both of them were redheads, with blue eyes and very fair complexions. They actually looked so similar that the doctors felt it necessary to explicitly point out that the two were not “blood kin” in their medical reports. Despite the two factors the doctors listed, it seemed that the young girl was simply an oddity – her parents had had seven other children, all of whom were perfectly ordinary. Later, it would be determined that she was born with dipygus and her condition was likely the result of her body’s axis splitting as it developed. As a result, she was born with two pelvises side by side. With each pelvis, she had two sets of legs, one normal sized, and one small. The two small legs were side by side, flanked on either side by two normal legs, though one with a clubbed foot. According to medical journals written by the physicians that studied Myrtle Corbin throughout her life, she was able to move her smaller inner legs, though they weren’t strong enough for her to be able to walk on. Which, of course, didn’t really matter, as they were not long enough to touch the ground. In 1881 at age 13, Myrtle Corbin joined the sideshow circuit under the moniker “The Four-Legged Girl From Texas.” After showing her to curious neighbors and charging them a dime each, her father realized her potential for publicity and for cash. He had promotional pamphlets made up and began placing ads in newspapers for people to come see her. The promotional pamphlets described her as a girl with “as gentle of disposition as the summer sunshine and as happy as the day is long.” And, indeed, that appeared to be true. Throughout her time as a sideshow attraction, she became wildly popular. Eventually, rather than bringing the curious onlookers to her she began traveling. By visiting small towns and cities and performing for the public, she ended up earning up to $450 a week. 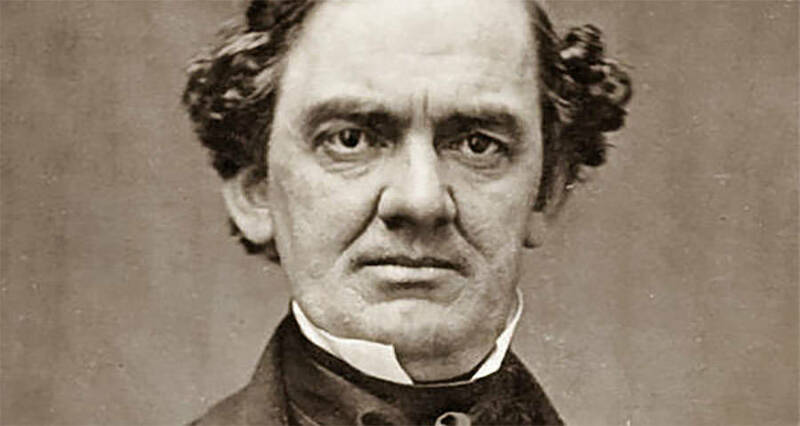 Eventually, famed showman P.T. Barnum heard about her and hired her for his show. For four years, she continued to work for Barnum and even inspired several other showmen to produce fake four-legged humans for their own shows when they couldn’t get her. 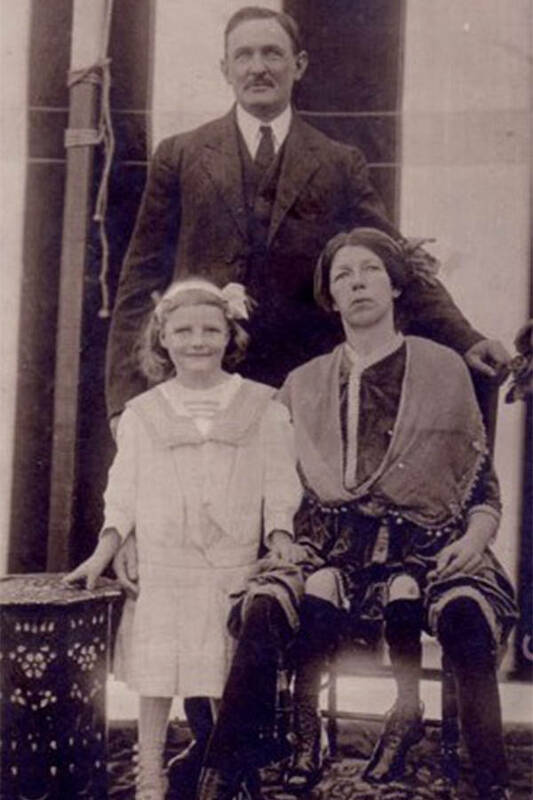 Myrtle Corbin with her husband and one of her daughters. At 18 years old, Myrtle Corbin retired from the sideshow business. She’d met a doctor named Clinton Bicknell and fallen in love. At 19, the two were married. About a year later in the spring of 1887, Myrtle Corbin discovered she was pregnant. She’d gone to a doctor in Blountsville, Ala., complaining of pain in her left side, fever, headache, and a decreased appetite. Despite her unique anatomy (she had two sets of internal and external reproductive anatomies), doctors did not believe there was a reason she couldn’t carry to term. Though she became gravely ill during the first three months of her pregnancy, resulting in her doctor performing an abortion, she ended up giving birth to four more healthy children in her life. After performing in the sideshow and giving birth to her children, Myrtle Corbin’s life was rather normal. Though her case continued to pop up in medical journals around the country, she maintained a quiet existence in her Texas home with her husband and children. Eventually in 1928, she died as the result of a streptococcal skin infection. Though antibiotics make the condition easily treatable today, in the 1920s there was no such treatment available. On May 6, 1928, her casket was buried and covered in concrete. Various family members stood vigil over the drying concrete until it was set, an extra precaution to prevent grave robbers from stealing her corpse. After all, several physicians and showmen had offered money for her body, and her family knew that there were people willing to go to great lengths to get one last piece of Myrtle Corbin, The Four-Legged Girl From Texas.